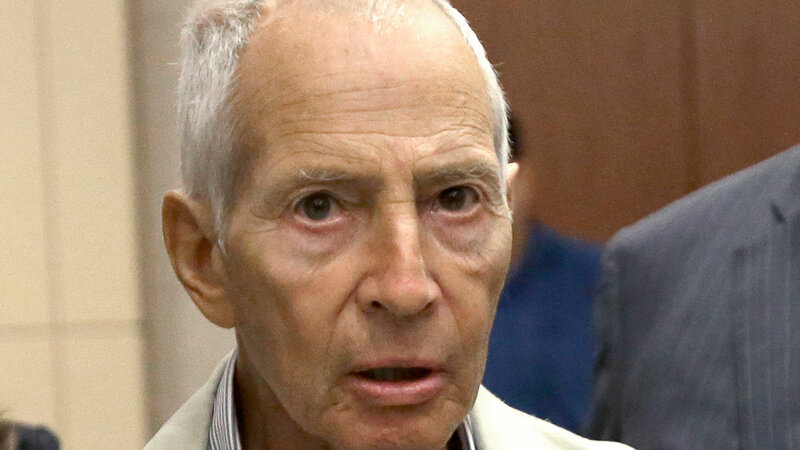 NEW ORLEANS, LA -- Robert Durst, an eccentric millionaire from one of America's wealthiest families, was arrested on a murder warrant just before Sunday's finale of a serial documentary about his links to three sensational killings. FBI agents arrested Durst without incident Saturday at a New Orleans hotel on a warrant from Los Angeles for the murder of a mobster's daughter 15 years ago, authorities said. Durst participated in the documentary, giving an extensive interview to filmmaker Andrew Jarecki for "The Jinx: The Life and Deaths of Robert Durst." Lewis said nothing his client revealed changes his innocence. But Durst's estranged and fearful relatives thanked authorities for tracking him down. "We are relieved and also grateful to everyone who assisted in the arrest of Robert Durst. We hope he will finally be held accountable for all he has done," said his brother, Douglas Durst, in a statement. Berman, 55, a writer who became Durst's spokeswoman, was killed at her home near Beverly Hills with a bullet to the back of her head as New York investigators prepared to question her in the unsolved 1982 disappearance of Durst's wife, Kathleen. "The jig is up," said former Westchester County District Attorney Jeanine Pirro, who had hoped Berman would help solve the disappearance. The documentary uncovered "evidence that law enforcement in three states wasn't able to unearth," added Pirro, who now hosts Justice with Judge Jeanine on Fox News. The climax of last week's episode revealed a hand-written address on a letter, recovered by the slain woman's relative, that Durst had sent to Berman. The handwriting seems virtually identical to an anonymous letter alerting Beverly Hills police to a "cadaver" in Berman's home. Even the word "Beverly" is misspelled as "Beverley" on both documents. Durst observes in the documentary that only Berman's killer could have sent the letter to police. The episode didn't indicate whether Jarecki shared that earlier letter with the authorities, but the Los Angeles Police said the arrest resulted from "investigative leads and additional evidence that has come to light in the last year." Lewis said he didn't know if police had previously examined the newly revealed letter, but said Durst had provided handwriting samples to LAPD in the past. He's got no doubt the timing of the arrest was orchestrated in coordination with HBO's broadcast of the final episode. Neither LAPD nor the movie's producers would comment on that claim. After Berman's death, Durst moved to Texas, where he lived as a mute woman in a boarding house until his arrest in 2001 after dismembered parts of the body of his elderly neighbor, Morris Black, were found floating in Galveston Bay. Durst then became a fugitive, until he turned up shoplifting a chicken sandwich, Band-Aids, and a newspaper in Pennsylvania, even though he had $500 cash in his pocket and $37,000 in his rental car - along with two guns and marijuana. Lewis told the jury that Durst shot Black in self-defense and suffered from Asperger's syndrome. Despite admitting that he used a paring knife, two saws and an ax to dismember Black's body before dumping the remains, Durst was acquitted of murder. Durst still faced some consequences in Texas - in 2004 he pleaded guilty to bond jumping and evidence tampering, but with time served, he was paroled in 2005. Then, violating the terms of his parole, he returned to the boarding house where Black was killed, and had to serve another four months in jail. Durst "has been incredibly lucky that so many people who've investigated him have dropped the ball, but I think that luck may be running out," said former Galveston County District Court Judge Susan Criss, who presided over the Texas murder trial. Lewis defended Durst again in Texas after he inexplicably urinated on the candy display at the cash register of a CVS pharmacy in Houston last year. Durst paid a fine and compensated the store for what Lewis called an "unfortunate medical mishap." Durst left his Houston town house for New Orleans to escape unwanted attention since the documentary's second-to-last episode aired, Lewis said. Robert Durst had known tragedy from an early age - when he was seven, his father called him onto the roof of a building to try to persuade his suicidal mother not to jump. He left before seeing her fall. Also in 2013, Durst tried unsuccessfully to claim $82,000 from his missing wife's estate, even though his personal net worth has been estimated at about $100 million. "The story is so operatic," Jarecki told the AP before his documentary aired. "That's what's so fascinating to me - seeing someone who is born to such privilege and years later is living in a $300-a-month rooming house in Galveston, Texas, disguised as a mute woman." Jarecki told a fictionalized version of Durst's story in "All Good Things," a 2010 film starring Ryan Gosling. Then he got a call from Durst himself, who wanted to see it, and eventually agreed to talk on camera. Jarecki said his documentary has left him with a "firm conclusion" about Durst's guilt or innocence. But he wasn't saying before Sunday's final episode.